Spain has emerged as one of the premier golfing destinations in Europe. The Costa del Sol offers a perfect seaside climate, fabulous luxury resorts and championship golf courses. Fresh Atlantic winds, due to the proximity of the Straits of Gibraltar, mix with the mild Mediterranean winds and help to moderate the temperatures. Travelers experience exceptional cuisine, wine, ambience and flair of this southern European culture. Combine all that with daytrips to Marbella, Malaga, or even Seville and some of the best golf in Europe for a fantastic and complete golfing journey. Arrive Spain at in Malaga airport and after a 60 min drive along the coast check into the new 5 star highly recommended Finca Cortesin Hotel, Golf & Spa site of the Volvo World Match Play Championship. The Finca Cortesin offers a unique concept in luxury. Near the sandy beaches between Marbella and Sotogrande, this beautiful Costa del Sol luxury hotel offers a stunning array of resort amenities. It’s the perfect base from which to play the best golf courses in southern Spain while relaxing in posh setting. Break from golf today. Enjoy the beach at Finca Cortesin Resort. Take a day trip to Granada or Marbella. Enjoy the abundant sunshine in southern Spain. Play Sotogrande which opened on the Costa de Sol in 1964, it is maintained in immaculate condition and has long been considered one of the top courses in Europe. 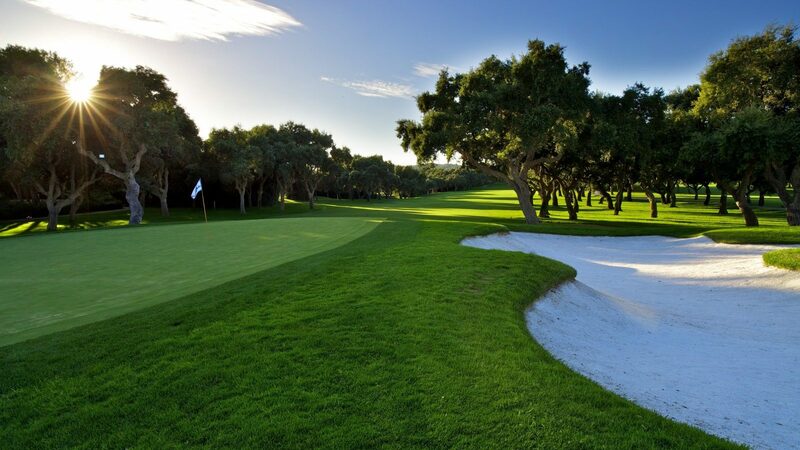 Sotogrande was the first course Trent Jones designed in Europe and is blessed with his design philosophy, which consists of building courses perfectly integrated with the natural surroundings which are a great challenge to the better players, but accessible and enjoyable for everyone. Play Valderrama, the famous Valderrama course on the Costa del Sol hosted the 1997 Ryder Cup matches. It is a course which invariably is in excellent condition throughout the season. Valderrama has been ranked as high as #1 in Continental Europe. It demands precision from the tee to find the narrow fairways nestled between cork trees. 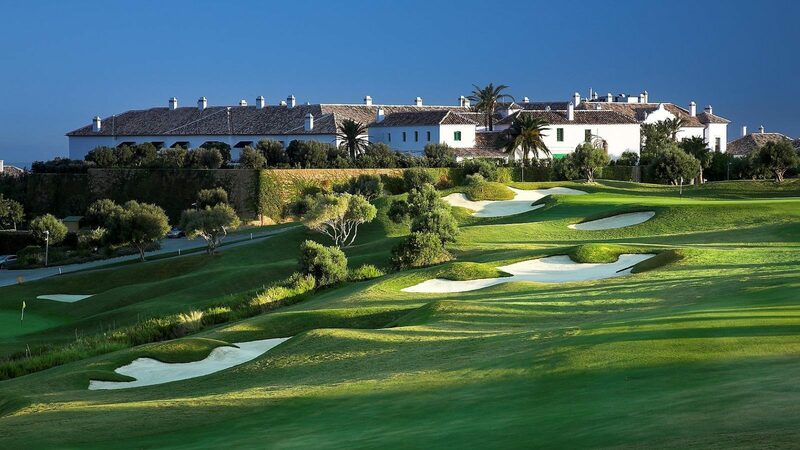 Play Finca Cortesin for a second time located at the resort. Instead of golf on this day choose to use this day to explore the region. Plan a daytrip to Gibralter, located 90 min away, Marbella about 30 min away or Malaga 60 minutes away. Malaga is definitely the choice over Marbella. Malaga has a very authentic Spanish feel, nice beach front promenade, exquisite cathedral, and charming and old town. You can also choose Gibralter with over a thousand years of Moorish, Spanish and British history. The Rock of Gibraltar dominates the entrance to the Mediterranean between the southern tip of Spain and the continent of Africa. The journey time from Marbella to Gibraltar is about 90 mins though varied and interesting terrain. Play La Reserva La Reserva is the newest addition to the courses of Sotogrande. Designed by Cabell Robinson and opened in the autumn of 2003 to outstanding reviews. The course lies within the Sotogrande complex to the north of Valderrama. The club is situated in a spectacular spot featuring marvellous views of both the mountains and sea. Depart Spain and transfer to Malaga Airport to board your flight back home. Southern Spain is blessed with sun, sand and surf, and a landscape that is ideal for the game of golf. And while golf resorts the world over are a conservative lot, Spanish hotels have been quicker than most to modernize beneath its traditional red tile roofs, the new Finca Cortesín is a contemporary style luxury resort of the new breed. The Finca Cortesin offers a unique concept in luxury. Near the sandy beaches between Marbella and Sotogrande, this beautiful Costa del Sol luxury hotel offers a stunning array of resort amenities. It’s an all-suite property, with some 67 of them, all open onto a private garden or terrace. The hotel features an 18-hole championship golf course and golf academy, spa, upscale shops on property. Finca Cortesin is artfully designed private paradise for those seeking an exclusive luxury hotel along the southern coast of Spain. Its located 60 minutes from Málaga Airport. The 4 star Hotel Almenara is located in the unique surroundings of Sotogrande overlooking the Mediterranean and surrounded by some of the best golf courses in Europe. The Almenara has 148 rooms surrounding the Almenara golf club with decoration based on natural materials that maintain a warm and genuine local color. Almenara also has 10 two-bedroom bungalows type suites which are very comfortable and perfect for small groups that like villas. Its located 30 minutes from Marbella 60 minutes from Málaga Airport. Almenara golf course has three nine-hole loops which have beautiful views of the hills and surrounded by cork oaks. This course is a good choice for golfers choosing to stay at the Almenara resort. Spain golf packages are fully customizable! Groups can also consider villa type accommodations within the Sotogrande region.